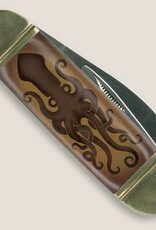 That tentacled terror of the deep, "The Kraken" is now the coolest pocket knife on the planet! This classic "sunfish" style pocket knife harkens back to the days when every man in America carried a blade with him wherever he went. My grandfather always said, "A smart man will always keep his powder dry, his knife sharp, and his whiskey handy." 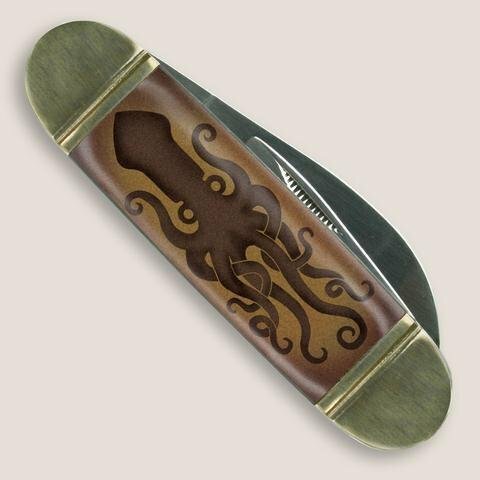 This Trixie & Milo pocket knife has a hand sharpened blade made from 7CR17MoV grade stainless steel, solid brass bolsters, and an original Americana style design printed on the handle. Featuring a 3"L. x 1"W. blade, and a 1.5" bottle opener & flat head screwdriver blade.